LOGAN – Practice ended around 5 p.m. Monday afternoon. After most of the Aggie basketball players hit the showers and the coaching staff had left, Koby McEwen stayed on the court. The guy who had been named the Mountain West Player of the Week just hours earlier felt he needed to take extra shots. The conference honor came after 28- and 21-point performances in back-to-back wins. 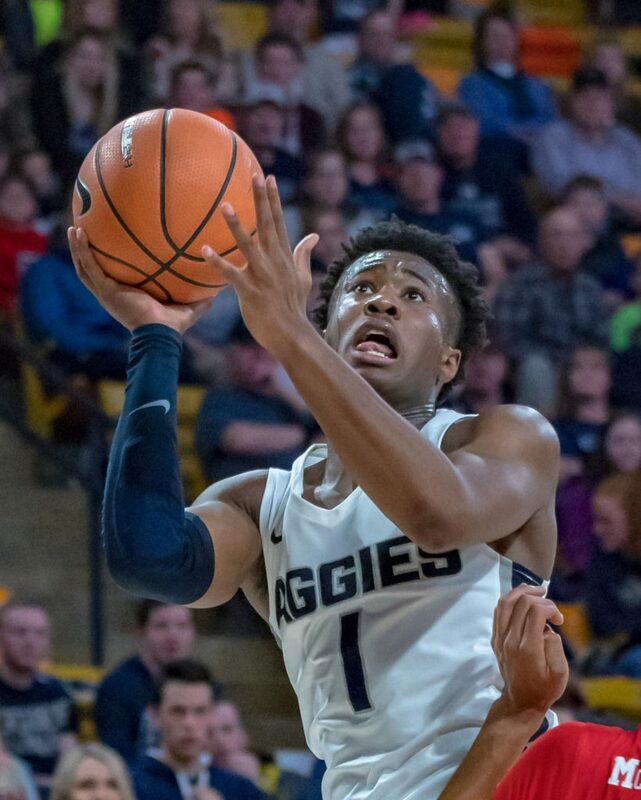 It was the type of production many Utah State fans had been expecting from their star sophomore point guard, but something they hadn’t seen in a while. McEwen admitted he had lost a lot of confidence earlier in the season when he was fighting an injury that sidelined him for four games. Now he feels he has it back. The difference through the last few games has been obvious to Aggie fans. Head coach Tim Duryea’s comments after the gutsy comeback and subsequent overtime win against Fresno State echoed thoughts of many who saw it firsthand. “Koby McEwen was Koby McEwen tonight,” he said. Less than a month earlier, Duryea had opposite things to say about McEwen’s performance, when he had one of his worst games on one of the biggest stages of the year. In an NBA arena against an instate rival, McEwen went scoreless for the first time in his career, fouling out with more than eight minutes left in the 10-point loss to Utah in Salt Lake City. Duryea summed up the performance as “awful.” It was just one of several subpar games for McEwen, but his recent bounce-back came just in time for Mountain West play. In non-conference play McEwen averaged 11.7 points, three rebounds and 2.9 fouls per game. Since then he has averaged 22 points, five rebounds and just one foul per game. Regaining confidence was a process, McEwen said, but was made easier with the support of good people by his side. He got it back the same way he earned it in the first place: with a strong work ethic. McEwen is a strong believer in the principle of hard work. He said he has learned that the only way to get yourself where you want to be is to put in work. Because of his school schedule, coming to practice early is usually out of the question, but he said he still finds as much extra time as possible to get in extra shots and workouts. Just like he did after Monday’s practice. McEwen’s grind is reflected in his gameday routine. For a 7 p.m. home tipoff he is in the Spectrum and showering by 4 p.m. Then he gets taped up and gets on the court to take as many shots as he can while running through the playlist on his phone. The pregame process has been consistent since high school. “I say a couple of prayers before the game and when game time hits, I’m ready,” he said. 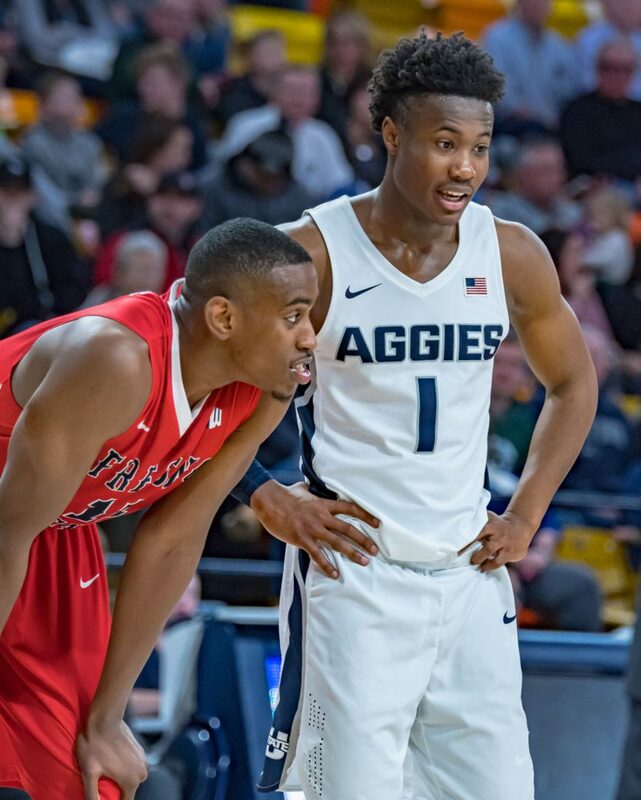 With injuries piling up for USU, Duryea is relying more than ever on his sophomore point guard, but McEwen said he doesn’t feel any added pressure. He is trusting in the added hours behind the scenes.